What is the most overlooked terroir in California? It is a question I am asked often. The answer is always the same: The Santa Cruz Mountains. These rugged hillsides just south of San Francisco are home to some of the world’s greatest vineyards and wines. Fabulous, age-worthy Chardonnays, Pinot Noirs and Cabernet Sauvignon-based reds all flourish on these dramatic mountain sites. To be sure, farming and winemaking in the Santa Cruz Mountains can only be described as a labor of love. Yields are typically tiny by world standards, the weather is capricious and there is no easy way to reach the consumer directly, as wineries can so easily do in many other parts of the state. All of that actually works in the consumer’s favor, as most of the wines – even at the highest level – remain very fairly priced next to global benchmarks. And make no mistake about it, the top Santa Cruz wines are among the world’s elite. To say that 2011 was difficult in the Santa Cruz Mountains is a massive understatement. Yields are never generous here, but in 2011 they were depressingly low. To add insult to injury, making top-flight wine in 2011 required extraordinary diligence and sacrifice, which, to put it simply, meant far higher labor costs, especially in the vineyards. So the wines were much more expensive to make than normal, but there is a lot less to sell. Not exactly the type of scenario that makes bean counters happy. As was the case throughout the state, in 2011 cool weather the entire year delayed the harvest by at least a few weeks for all varieties. Unlike 2010, there were no heat spikes whatsoever. On average, alcohols are 1% lower than normal, which is incredible, given that alcohols are never particularly high here by California standards. Overall, 2011 is more consistent with Chardonnay than Pinot Noir, which was literally devastated by horrible flowering and high amounts of shatter to the point some sites essentially produced no fruit whatsoever. There are only a handful of Cabernet Sauvignon-based wines made in the Santa Cruz Mountains, so the value of generalized comments seems dubious, but what I have tasted so far is promising. I have not tasted enough Syrahs and Syrah-based wines to form a conclusive opinion, but the wines I have tasted so far are medium in structure and similar in style to the Pinots. Readers who want to discover the best California has to offer owe it to themselves to make sure the Santa Cruz Mountains is on their radar. For more on the region’s geography, readers may want to revisit the text below, from an article originally published in 2011. The Santa Cruz Mountains is arguably the least well known of California’s top winemaking regions, which is hard to believe, since Ridge and Mount Eden have been considered two of the country’s top estates for decades. A number of other wineries are within easy driving distance of San Francisco, Cupertino and the Silicon Valley. The Santa Cruz Mountains are technically not a part of the Central Coast, nor are they considered part of the North Coast, which may explain why they are often overlooked. Make no mistake about it; these hillsides are home to a number of superb sites for Chardonnay, Pinot Noir, and to a lesser extent, Bordeaux varieties. I am still not convinced the Santa Cruz Mountains are as favorable to Rhȏne varieties as other parts of the state, but time will ultimately tell. 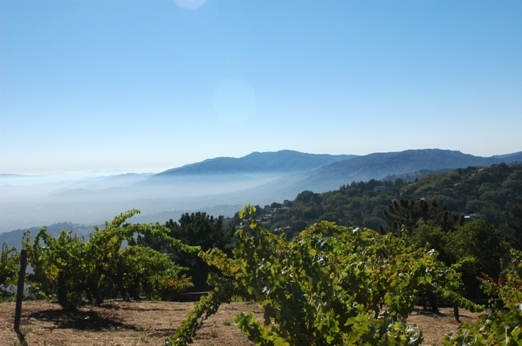 The Santa Cruz Mountains is a dramatic appellation divided by the San Andreas Fault. The entire AVA is considered a cold micro-climate, but even here there are important aspects of the topography and climate to consider. The eastern side of the appellation is further away from the Pacific and closer to San Francisco Bay. Temperatures are therefore warmer, and it is possible to ripen Bordeaux varieties, the most famous being those grown on Ridge’s Monte Bello vineyard. The western side of the appellation, closer to the Pacific, is colder and better suited to Pinot Noir and Chardonnay. As I have done for the last two years, once again this year I am dividing Central Coast coverage into several smaller articles in order to give greater focus to each of the specific regions that make up this vast set of appellations that essentially spans just north of Los Angeles to just south of San Francisco. Articles on the Santa Lucia Highlands and Paso Robles will follow over the next few weeks to round out published reviews on the wines of Santa Barbara and the Santa Cruz Mountains. All of the wines in this article were tasted in June 2013.